Often when albums of a personal nature are released, the describing words ‘transparent’ and ‘raw’ are used. I’ve been one to throw them around from time to time. But sometimes you press play on a record that is so intensely transparent that it blows all the others out of the water. That, friends, is what you discover in NF’s Mansion. Nate Feuerstein first caught our attention last year, when his NF EP dropped. The Michigan rapper had landed a record deal with Capitol CMG, and his fanbase exploded. The taster EP had many of us salivating for more, and when I spoke to Nate last August, he said he was saving some surprises for his full-length. Never would we have dreamed that it would be such a massive album as Mansion, and we’d be hearing it just half a year later. In short, Mansion is a metaphor for NF’s mind. It’s a big space, and quite often a dark place. The gloomy album cover is quite reflective of the sound and content of the record. As Nate explains on the title track, ‘My mind is a house with walls covered in lyrics, they’re all over the place… you get the uncut version of life when I go downstairs. That’s where I write when I’m in a bad place and need to release, and let out the version of NF you don’t want to see.’ As Nate shared with me and expresses on All I Have, he was physically abused growing up, lost his mother to a pill addiction, and music was the one thing that was consistent. So as you go on a tour of NF’s mansion, expect to discover more about the dark things that have shaped him, the struggles he still endures, and also a greater hope that lies beyond the walls. Intro takes you through the foyer of NF’s mind, a chilling cinematic soundscape with some quickly spat cadences. NF expresses thankfulness to God for where he has been brought, but there’s a sense of anticipation that there’s more of a story ahead. Wait is one of the standouts on the album: a smooth, slower, R&B-esque number that sounds like something crafted by For KING & COUNTRY. After the intensity of the opening tracks, it’s a surprise to hear NF spend more time singing than rapping. Nate has quite a skillset. A quieter moment of reflection arrives on Notepad. It’s a song written from Nate to a friend of his, who we discover, shares a passion for music. There’s a real slow grind on this track, it’s super smooth, but still quite dark in sound. The stakes are raised on Turn the Music Up – the undisputed banger on the record. It’s fist-pumpingly solid. This is probably the track that I felt fit least with the overall sound of the record, but will keep NF’s dance fans happy. Another moment of soft self-questioning is shared on Paralyzed. It’s remarkably stark after the punch in the face of Turn the Music Up. NF shows off his impressively singing ability – with harmonies – ‘I’m paralyzed. Where are my feelings? I no longer feel things I know I should.’ The song builds beautifully, adding some dubstep beats and synths. Our tour concludes on Can You Hold Me, a super sweet duet between NF and Britt Nicole. It’s a big orchestral ballad to wrap things up, and both sing so well. 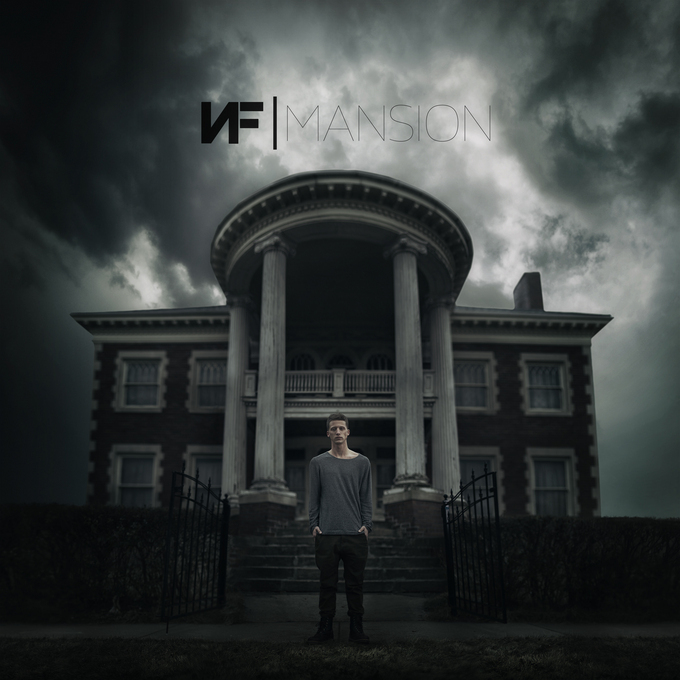 Pounding drums aid the build, and NF sings, ‘If I ain’t got you, I’m lonely… I need you.’ NF struggles to get out of his mansion, but he knows that God is the only thing that can help him do it. And it’s clear that whether the walls are crumbling, or stockpiled with sin, NF is still working through all this and is super bold to share it with us listeners. NF’s Mansion is an aggressively transparent, moving, and challenging listen. This is Nate Feuerstein’s mind in twelve confronting tracks. My prayer is that this album would reach out to many who are holed up in dark mansions, and will be able to break through the walls to see the light of Christ. Four stars. Mansion by NF will be released Tuesday, 31st March and can be pre-ordered on iTunes from March 17. Keep an eye out for our chat with NF about the album in the coming weeks. Posted in MusicTagged Album Review, christian, Mansion, Nate Feurerstein, NFBookmark the permalink.